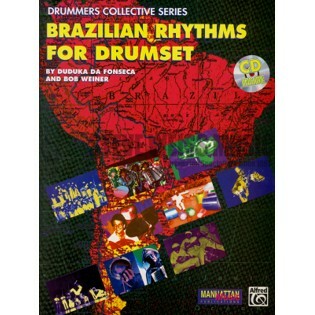 Brazilian Rhythms for Drumset by Duduka da Fonseca and Bob Weiner presents a solid and extremely valuable guide to applying traditional Brazilian rhythms to drumset. It delves into the complexities of Brazilian rhythms and also helps explain the background and influences of the rich musical history of Brazil. Includes samba, partito alto, bossa nova, baiao, caterete, maracatu, marcha, frevo.